Jewelry Boxes with Necklace Sides - For storing necklaces with care, a jewelry box armoire with swing out necklace sides, or a jewelry box with a drop down necklace storage area is the best choice. 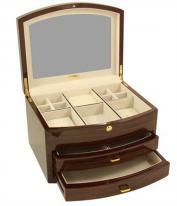 Available in mini dresser top designs or floor standing jewelry box models, our necklace jewelry boxes with armoire doors and necklace drops are ideal for organizing necklaces. 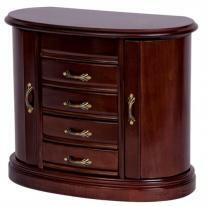 If you don't see the necklace jewelry box or mini dresser top jewelry armoire that you are looking for, we welcome your call or email. 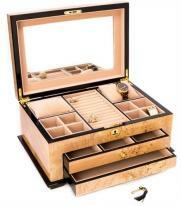 All necklace jewlery boxes qualify for 1 year product warranties and easy 30 day returns.